I got into a conversation recently about Memorial Day traditions. My family has family reunions. I don't go because in case you are new around here, I am not crazy about a large portion of my family. A friend of mine has a standing camping trip with the guys, absolutely no girls allowed and don't even think about suggesting that he not go because that just will not happen. 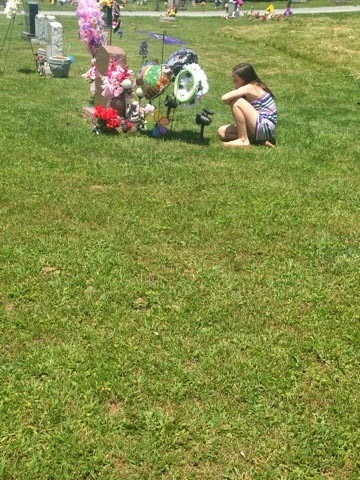 Em and I made our yearly trip to the grave of her friend. She wants to go on the girls birthday so she can say Happy Birthday to her. It makes me cry like a baby when I take her. She always asks me to start ahead of her so she can talk to her alone. You should not lose your best friend when you are 9. You should not have to visit her at a cemetery. She should be enjoying sleepovers. They should be on the same volley ball team. They should have gone to honors choir together. It makes me so sad that it has to be the way it is. I say a prayer for her family because I can't even begin to imagine their pain. On to happier topics. School is out for the year and I could not be more happy. But of course as soon as I can sleep in I begin waking up on my own at 6 am. I don't even need to get up at that time when it is a school night. Its not like we set out to do big household things during memorial day its just school has always just let out and we finally don't have anything else pressing to do. It breaks my heart that she has to go through this. I feel so bad for her and the girls parents. 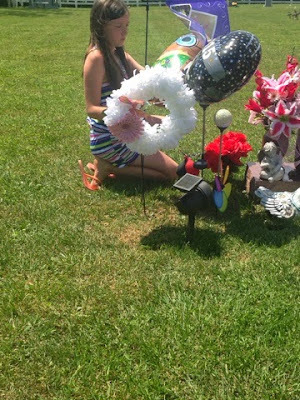 Its hard to visit the grave but as long as she wants to do it we will.